Shiver me timbers, afore I click-eed this here thread I thought ye was talkin’ about software pirates! For the record(argh), I celebrate this wondarful holiday every year. Aye! Go get scurvy! Woot! teh warez on limewire pwns!! I has teh l22t appz!! :no: To Davy Jones’ locker with ye. Arrr, thur matey, i twas a thinkun along them same lines! 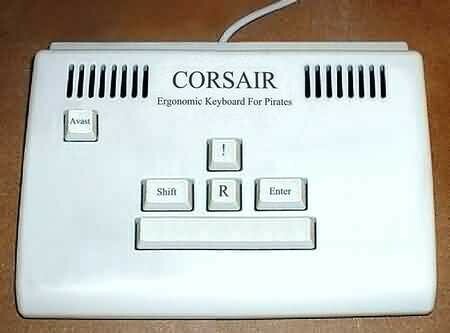 An get yer bosun to haul yer proper keyboard out 'o the locker. avast mateys, what more do ya need? R! R! R! Yarrrrr!!! Peaches ‘ill be keepin’ the scurvey away me thinks. So go lay down yer gold to fetch one now, matey! Yarrr!!! this reminds my old head of the movie me and my ship mates are working on… so thee old captian will make me to this tread to get in the mood to do the CGI witch will be so aswome it will make us enough moneys to buy a new boat yarrharrdiehar!!! Keelhaul the landlubber who dares tread on this here thread! Arrh. What be this? Perhaps me’s been watching Pirates of the Caribbean to many times. Yarr, ye ain’t benderin’ till ye’ve got seen some booty! Yarr that was nice booty, now ah aim goin’ back ter work. i like sponge bob, do it counts ?